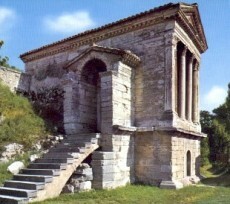 The little temple of the Clitunno, located in Campello sul Clitunno, has still maintained the classical name of the river having its source nearby. Plinio describes the source not only as the aim of a local adoration but also as a place that is worth being visited by all. The Imperator Caligola came on purpose one day to visit it and also Onorio, travelling on the Flaminia road, expressed the desire to visit this source. The Temple lies on a high and severe basement equipped of a door at the center, through which one enters an underground having a T form. The vestibule presents on the front two lateral pillars and four columns sustaining the cornice work and the tympanum. Through two fronts bordering the "pronao" one arrives first to the vestibule and then to the cell completing the nice edifice. In the tympanum as well as in the sculpture decorating the main front of the cell, is represented Costantiniano that entirely preserves his monogram. On the lintel of the front is moulded the dedicatory epigraph: "Scs deus angelorum qui fecit resurectionem". Bella Umbria thanks Mr. Massimo Eugenio Micanti, from the Centro Restauro Terni, for the collaboration for the realization of this article. On 25 June 2011, the Temple of Clitunno was listed as a "Lombards in Italy: placesof power" which makes a World Heritage Site by UNESCO, in the same list is also the Church of St. Salvatore in Spoleto.